As hip-hop culture spreads in the Russian-speaking world, some of the most prominent artists to emerge are not Russians. A Russian friend once explained to me that the world’s first rapper was the esteemed Russian poet Alexander Pushkin (1799-1837). My friend explained that Pushkin met all the criteria for a rapper: Pushkin was black (his great-grandfather was African), he had great rhymes (he is considered the “Shakespeare of Russia”), and he had “street cred” (the poet was fatally shot in a duel). Certainly, this crude anecdote shows a limited view of what constitutes a rapper, but it does illuminate how the genre has become immensely popular in Russian-language music. Poetry has long been a dominant force in written and spoken Russian culture, even until the late 20th century in the Soviet Union with Vladimir Vysotsky. There could be an argument that due to repetition in Russian word endings, the Russian language is well-suited to rhyming. So when the Soviet Union collapsed and artists were exposed to Western genres, it was no surprise that early Russian rappers like Bogdan Titomir, Liki MC, Bad Balance, and Mal’chishnik quickly emerged. As hip-hop culture continues to spread across the Russian-speaking world, some of the most prominent artists are not ethnically Russian, even if they perform in the Russian language. Front and center is the Tatar-Jewish Timati – the most commercially successful Russian-language rapper, who ranks fourth in wealth on Forbes’ ranking of Russian entertainment and sports stars. Timati founded Black Star Inc, one of the largest rap labels in the Russian-speaking world. Black Star has picked up many non-Russian rappers such as Natan, who hails from Almaty. Kazakhstan has proven a particularly fruitful area for Russian-speaking rappers, likely because of the country’s large Russian-speaking population. Three of the most popular rappers in Kazakhstan – Natan, Jah Khalib and Scriptonite – rap in Russian. All three portray diverging views of the direction independent Kazakhstan is heading. Through music, Natan loses his Kazakhness in favor of a Russified identity, while Khalib creates an authentic Central Asian identity founded on Turkic and Islamic roots. By contrast, Scriptonite highlights the bleak life in Kazakhstan’s remote corners. Natan Mirov – known simply as Natan – was born in Almaty in 1986. But he rarely, if at all, references his Kazakh upbringing. Instead he has formed into an identity-less, sanitized pop star with a melodic flow comparable to pop rappers in America. He raps on banal themes like partying and girls. The video and lyrics are standard fare for a catchy rap hit that gets clicks on YouTube. The sexually charged verses always end with the hook, “My girl is the bomb,” while the video shows Natan and Timati judging an imagined dance show with scantily clad women and a stripper’s pole. The instantly recognizable hook – Natan whispering “Listen, why are you so cheeky?” – made this song a smash. The video portrays all the trappings of modern Russia’s conspicuous consumption, from the Mercedes Benz G-Class to the ubiquitous shopping malls. Natan’s song is the fast food of Kazakhs who rap – it has mass appeal, but not much flavor or quality. Born Bakhtiyar Mamedov in Almaty in 1993, Jah Khalib is ethnic Azeri and represents Kazakhstan with pride. When asked why he has not moved to Russia and signed with a label in Moscow or St. Petersburg, he told an interviewer that his “only label is Kazakhstan.” Khalib has a formal background in music, which he puts to good use creating his own beats. His music is more akin to Kanye West, where the music behind the rapping is almost more important than the lyrics. Khalib told Russian internet personality vDud that Leila was one of a few songs that came to him spontaneously. He wanted to add an “ethnic” flair to the song and settled on the Turkic name “Leila” and instrumentation influenced by the doira and dombra native to Central Asia. The song and music video are reminiscent of Central Asian epics that often focus on the search for a lost love. Khalib says he is Muslim. Medina refers to a woman, but it’s also a not-so-subtle reference to the holy city in Saudi Arabia. As in Leila, the instrumentation is classical Central Asian. The accompanying music video is more of an epic short about an ancient Kazakh warrior. 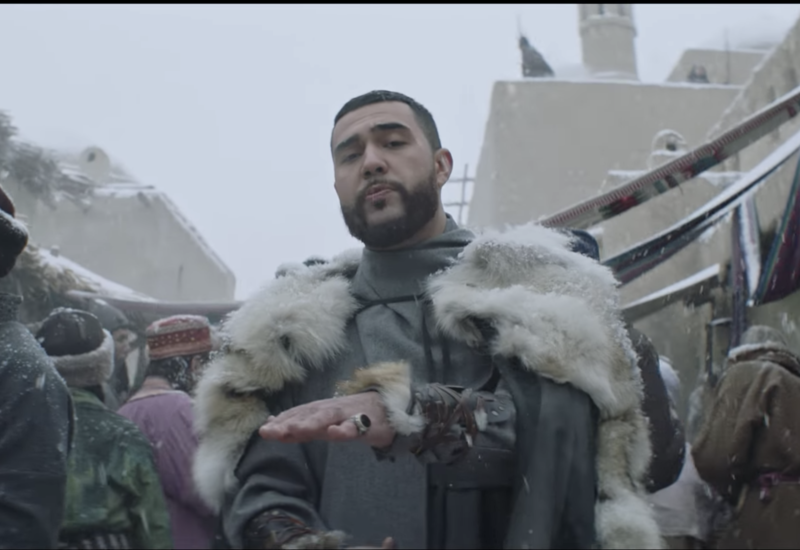 Khalib shows how an artist can take the genre of rap and infuse Central Asian themes and styles. Scriptonite was born Adil Oralbekovich Zhalelov in Kazakhstan’s hardscrabble northeast, in 1990. His rise to rap stardom closely mirrors the ascent of many rap artists in the United States who come from poor, economically depressed regions. In fact, in many of his early songs Scriptonite seems to directly mimic the “trap” style of rap, featuring heavy bass and dark lyrics. Just as artists rap about getting out of the “trap” of their surroundings, Scriptonite describes his own struggles to survive in a desolate corner of Kazakhstan bordering Siberia. The fiery song explains the difficult life in his hometown, Leninskiy. People are struggling for food and work: “You wanted a trap? Well this is a real trap.” He describes a place much different from the glamorous locales in Natan’s music and the fictional quests of Jah Khalib. The music video is classic rap onscreen with Scriptonite boosting his street cred by touring impoverished, almost post-apocalyptic scenes. This introspective tune follows a narrator who has hit his lowest point, or as the chorus says: “I am at the very bottom of the den, I’m in the trash.” The video shows a seedier side of Kazakh life, with drunkenness, drugs, prostitution, a robbery and general debauchery. Once again, Scriptonite separates himself from other Russian-speaking rappers with his focus on Central Asia's grittier side. Kevin Doyle received his master’s degree this year from Harvard University's Regional Studies: Russia, Eastern Europe, and Central Asia (REECA) program.